Kristine's Shower goodness available in these great combos! Perfect for Teachers, Co-Workers, Mail People, Newspaper Carriers... all those that you want to say "thanks" to! 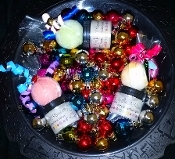 Sorbet & Bathbomb, dressed up for the holidays with ribbon and ornaments!